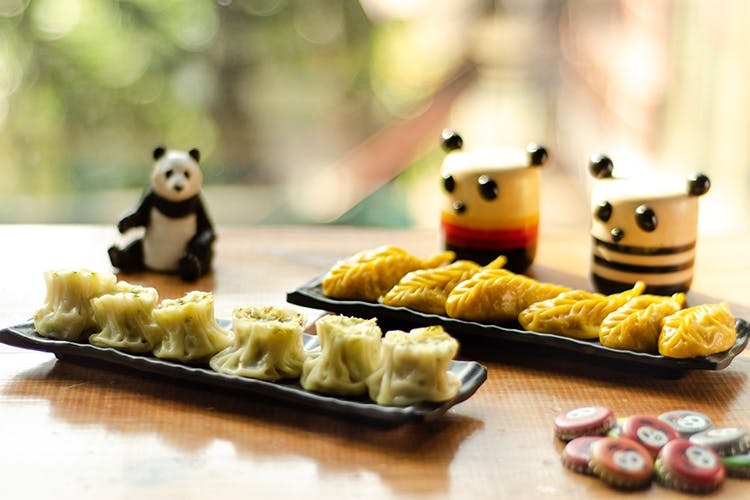 If budget Asian joints are your thing, you will love Koramangala's Noodle Panda that dishes out noodle boxes, greasy stir-fries, and dim sum all under the INR 300 mark. Plus, you go to order their cute panda rice with curry! Soul-comforting, budget Asian food is what these guys do best and their noodles boxes and curries come highly recommended. A self-service format, place your order at the counter and while you wait for your food to get ready, click some pictures of the Insta-worthy space. Think salt & pepper panda shakers and pop culture posters which have pandas photoshopped into it. A glass facade looks out to the busy 5th Block where it is located. Start with Grilled Teriyaki Bao and Sui Mai Dim Sums if you are nursing an appetite or on date night. Since custom noodle boxes are what they specialise in and you can order a regular or large Noodle Box and go crazy with combinations. Pick from regular, egg, udon or whole wheat noodles, then add on sauces like red chilli & basil, Momofuku ginger & scallion, or Sichuan, plus veggies, add-ons and toppings. But if you are giving the noodles a skip, then you are going to want to eat copious amounts of curry, as the rice comes shaped like a panda. No kidding! Finish off with the gooey Fudgy Cookie Dough Ice Cream With Oreo. Parking around the restaurant can be a nightmare if you are coming in a car. We suggest getting the help of valet services around the area.